Retail isn’t exactly thriving these days, and Champaign’s Market Place Shopping Center hasn’t been immune. LOFT, the women’s clothier and a staple on the mall’s south section, will close Jan. 27. Known for its professional wear and dresses, LOFT joins a number of similar stores that have closed at Market Place in recent months. Banana Republic closed in May. Eddie Bauer and The Limited closed their mall locations last January. The closings highlight a national trend away from brick-and-mortar stores, replaced by an increase in online shopping. 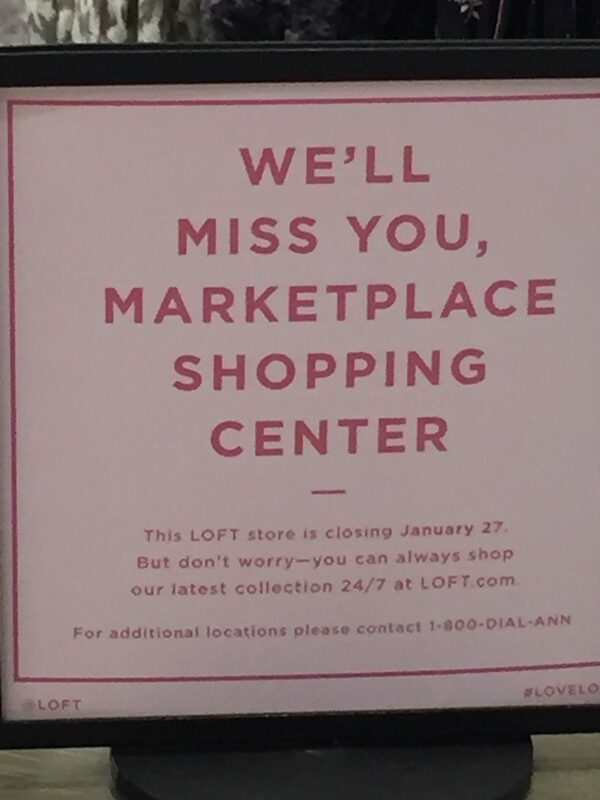 LOFT has signs posted in the store notifying customers of its closing date. Mall general manager Dennis Robertson confirmed the closing to Chambanamoms.com. Marissa Ellenby, public relations manager for mall owner GGP, was unavailable for comment. The mall has been buoyed by the additions of retailer Dry Goods, a spinoff of Von Maur, which opened last April.